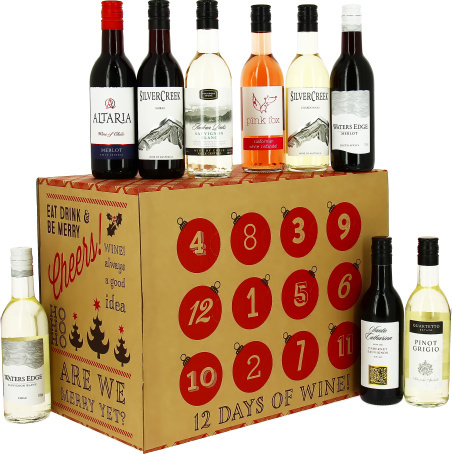 What better way to welcome the festive season than by counting down with 12 bottles of wine. This is the original and best Wine Advent Calendar! Each containing 187ml, these bottles are great for getting into the holiday spirit. Spoil yourself or send this gift to somebody special as an early Christmas gift. 1 x Silver Creek Shiraz 187ml Alc. 14% vol. 1 x Waters Edge Merlot 187ml Alc. 12.5% vol. 1 x Founders Stone Merlot 187ml Alc. 12.5% vol. 1 x Terramater Cabernet Sauvignon 187ml Alc. 13% vol. 1 x Founders Stone Shiraz 187ml Alc. 14% vol. 1 x Casa Dorado Tempranillo 187ml Alc. 13.5% vol. 1 x Silver Creek Chardonnay 187ml Alc. 13% vol. 1 x Villa Anton Sauvignon Colombard 187ml Alc. 12.5% vol. 1 x Quartetto Pinot Grigio 187ml Alc. 12.5% vol. 1 x Peplers Field Sauvignon Blanc 187ml Alc. 12.5% vol. 1 x McGuigan Black Label Rose 187ml Alc. 12% vol. 1 x Pink Fox White Zinfandel 187ml Alc. 10% vol.